The other and more significant Christmas event was my Nonna’s arrangement of the Christmas manger beneath Uncle Louis’ Christmas tree. Purchased in the early day’s of the depression, Nonna’s nativity figures were made of chalkware (moulded from plaster of Paris) and faded from handling. The figures were softly painted in colors not to dissimilar to doll prizes won at fairs and carnivals. My nonna’s nativity figures included: wise men; shepherds, sheep, a donkey, camels, and a cow. Inside the straw covered cardboard manger were the three most important figures: Mary, Joseph and the infant Jesus. I can vividly remember so many Christmas’ laying on the floor beneath the sprawling tree branches, staring at the miniature figures and imagining I was amongst them. 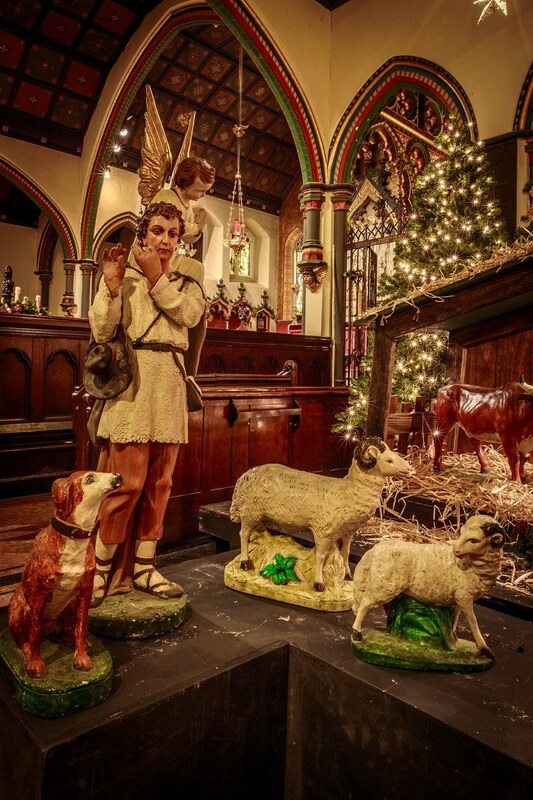 When I first saw Transfiguration's collection of nativity figures (many over a hundred years old) sprawled about the sanctuary, I felt something missing. It took me two years before suggesting moving the figures and display them collectively in a tableau to the side of the sanctuary. So with my two decorating cohorts, Maryann Wlock and Maurice Antaya, we created a version of the nativity with a background of Christmas trees. As beautiful as the new scene was received, something was still not quite right. 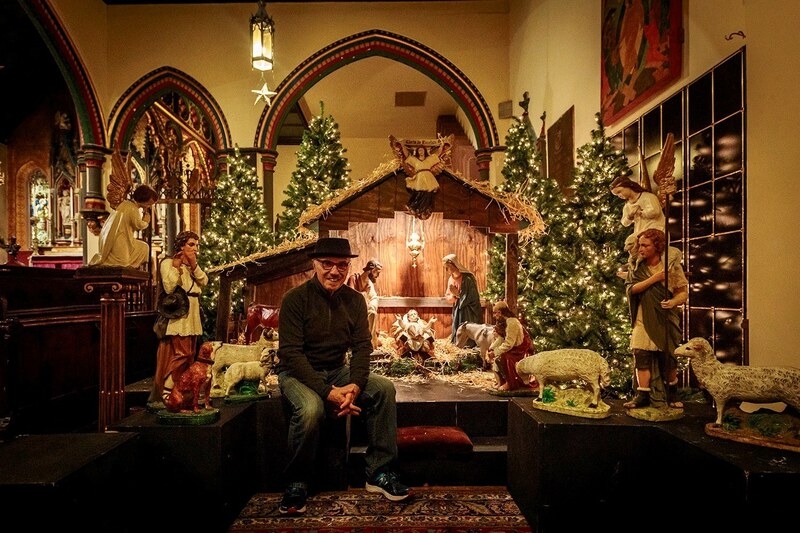 What was missing was the building - a manger. Putting pencil to paper, I drafted an idea for the new Transfiguration Christmas creche. After sharing and getting approval from Father John David, Maryann and Maurice, and I met with a carpenter who translated the drawing into a manger. Together, Maryann, Maurice, Tyrone (our verger) and I have now given the holy family and friends a new home. 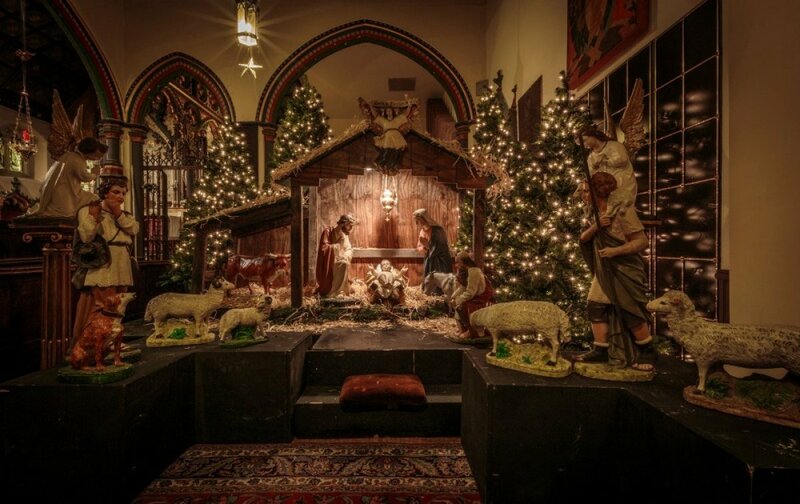 Each time that I look at the new Transfiguration Christmas manger, I will be reminded of my nonna, my Uncle Louis and my childhood memories of Christmas. For the longest time, I wondered if Uncle Louis purposely lopped off the tree top to create an illusion that through the ceiling a tree searched for a star to cast a beam of light on nonna’s Christmas figures. Buon Natale!